With the end of winter just around the corner, it is the perfect time of year to begin planning a home addition project. While the snow is still flying you can start planning your home addition and lining up your preferred home building contractor. By spring you can break ground and by the end of summer your home addition should be complete. A solid home addition plan is the key to success. The planning stage of your home addition is the most important stage of a home addition building project. It is during this phase of a home addition project that the home addition design and costs are determined. A good plan will ensure that the home addition project goes smoothly and stays on budget and schedule. There is a variety of low cost home design software packages on the market that can assist you in the design of the home addition floor plan and building structure. Many of the home design software packages are fairly easy to use and include 3D views of the drawings, as well as auto project cost estimates. When planning your home addition, it is important to consider how the addition will meld into the existing home structure and the surrounding landscape. The home addition needs to be scaled properly to the existing house so that it is of the correct proportion. An addition bigger than the main house will be aesthetically unappealing and an addition too small will look underwhelming and have limited functional value. Also, pay particular attention to the existing roof lines and foundation setbacks. The planning stage of building a home addition is also important for determining how the project will be financed. There are various home financing options pending the cost of the home addition project. The home equity loan is probably the most utilized approach for financing a home addition. Personal loans and refinancing the entire home for the additional financial resources required to build the addition are other options frequently employed. And of course, there is always paying cash if the project is of limited size and cost. Many homeowners plan to put in a great deal of their own sweat equity in a home addition project. However, it is important during the planning stage for the homeowner to really assess what they have for time and home improvement skills. Many homeowners frequently overestimate their free time and skill sets on planning a home addition. The result, the project gets delayed and cost overruns occur. Do not underestimate the work required on building a home addition. In most phases of a home addition project leave it to the professionals if you want the project completed in a timely manner. Building an addition onto your home is a great investment and usually much lower cost then selling your existing home and buying a new one. So with these tips in mind, start sketching out some home addition plans today and begin looking forward to your new and improved home. 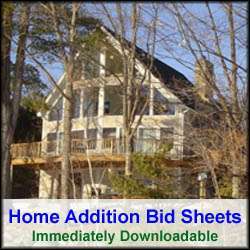 For more help on building and planning a home addition, see HomeAdditionPlus.com’s Home Addition Bid Sheets. Our Home Addition Bid Sheets provide you with the knowledge and information on how to plan a home building project, and what to look for when hiring contractors. They also include detailed cost breakdown tables and spreadsheets for estimating your own new home construction building costs.